One more topical post in honor of International Babywearing Week: If you are registering at Babies ‘R Us or Buy Buy Baby, and trying to find the right carrier for you, you’re in the right place! Mommy and Baby Lulu and I are going to run a face off between the Baby Bjorn and the Ergo. There are *worlds* of carriers available for purchase – on Etsy, on Amazon, and in tiny nooks of the internet where people vie for a spot on customs lists for one-of-a-kind hand made creations. 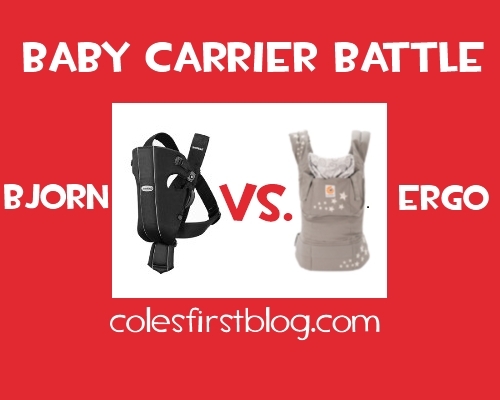 For most moms, however, the carriers readily available at the big box stores are more than sufficient to meet your baby wearing needs; we are going to compare the Baby Bjorn and the Ergo, as those are 2 of the most popular choices, and there are some distinct differences. Each carrier is available in a variety of colors and materials that account for the price differences. The Bjorn is available in a few different models with minor structural differences – the more expensive choices, for example, add a waist band for comfort. The Ergo is also available for a variety of prices, but the models all have the same basic shape; the differences are materials and colors. For the purposes of this review, I will be comparing the Baby Bjorn Classic in Black ($65), and the Ergo Original in Galaxy Grey ($93). Both of these are base models of their respective carriers. Both carriers are made from 100% cotton. The Bjorn is safe for babies from 8 to 26 pounds. 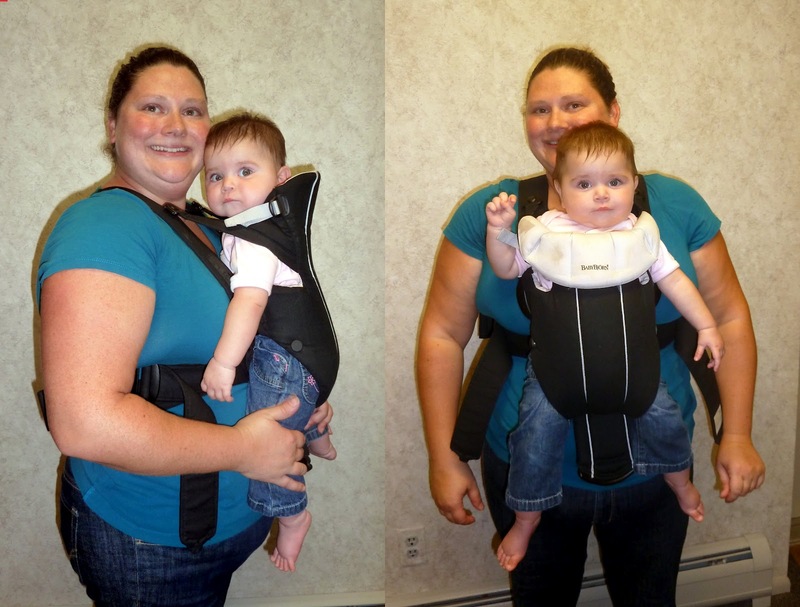 The Bjorn can be worn on the front only, with your baby facing in or facing forward. The Ergo supports wearing on the front (facing in), on your hip, or on your back. There are bibs and covers available to purchase to use with your Baby Bjorn. It will perhaps come to no surprise to regular readers here that Mommy was unimpressed with the Bjorn. Baby Lulu is a bigger baby, but was well within the stated weight limits for the carrier, and yet it sort of felt like she was going to burst out of it. There is NO way she’d be able to use it for much longer – let alone until 26 pounds! Mommy is used to wearing us (all. the. time. ), and she didn’t love the way the Bjorn distributed the weight. She felt like Lulu was pulling her forward, and her back began to ache in even the 5 minutes it took to get comparison photos. Also, the Bjorn would be of very limited use to us; it is not suitable for a toddler, so I’ve long since outgrown it, and Mommy does not like to wear us forward facing out. (Forward facing out carries can place pressure on the baby’s hips and spine, and do not allow the baby the opportunity to turn away from excessive stimulation. If your baby likes to see the world, we would recommend a hip carry or high back carry as more comfortable alternatives. Unfortunately, the Bjorn cannot be used for hip or back carries.) That means the only carry we could use the Bjorn for would be forward facing in with Lulu. The Ergo offers more variety in the holds it allows, and a substantially larger weight range. Additionally, Mommy prefers that we sit in a natural sitting position which the Ergo supports rather than the dangling of the Bjorn. (Again, the Bjorn’s positioning may cause spine and hip pressure.) The waist strap made the carrier more comfortable for Mommy; the baby’s weight wasn’t all concentrated on her neck and shoulders. We found the hip carry a bit awkward, and I’m a little big for a front carry at this point (although I won’t turn it down), but Lulu can be worn either on Mommy’s front or her back, and I have a long time before I’ll outgrow the back carry. For occasional use wearing a newborn or smaller baby, the Baby Bjorn is fine… but we have to recommend the Ergo. It does have a higher price point, but its use will last you MUCH longer than the Bjorn. In *our* experience, the Ergo was significantly more comfortable, and Mommy did not have the concerns over less than ideal positioning. The Bjorn is a one trick pony, but the Ergo’s versatility allows it to be used from the newborn stage all the way through toddlerhood. For those parents interested in babywearing and willing to explore the world beyond Babies R Us, there are MANY other soft structured carriers available; Mommy finds Olives & Applesauce to be the most comfortable, while Daddy prefers the Boba. Every time I do a babywearing post, we get tons of email; so who has questions? Mommy has worn me since I was about 6 weeks old, and Lulu from day one – she still wears me now, and I am three years old! We have experience with a variety of pouches, ring slings, mei tais, wraps, and soft structured carriers, AND both solo and tandem wearing. Here’s your chance to ask us anything! Leave a comment or shoot Mommy an email, and we’ll answer ’em. Barco Product Discount Coupons discount in all items etc.